A typical day includes morning and afternoon coaching sessions plus optional evening activities including sight-reading, master classes, a faculty concert, and participant performances. Coaching sessions will take place at a new location this year – Lake Placid Baptist Church. 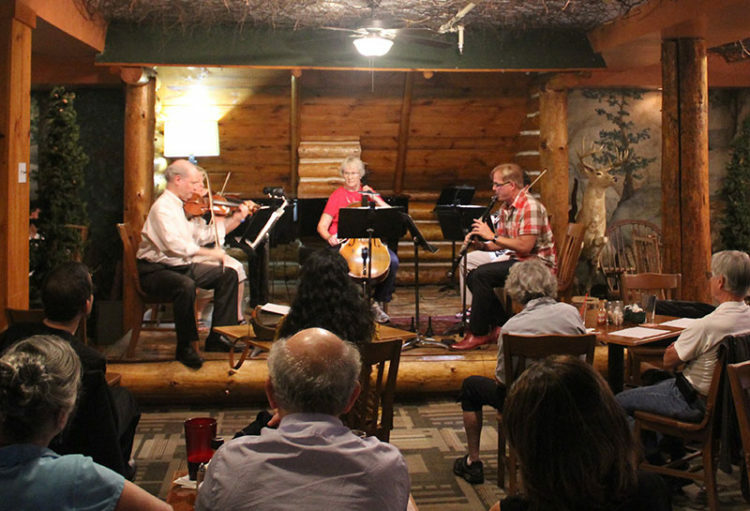 Performances are held at the Hotel North Woods Cabin Grill, an intimate and warm venue with charming Adirondack décor. A late afternoon break allows time for recreation, rest or enjoying the group social hour before dinner. 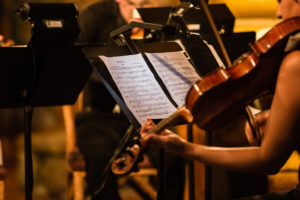 Participants who enroll as individuals will play in two different groups and should have basic music-reading skills and a com-mand of the instruments adequate for playing chamber music. (Levels A, B or C+ by the ACMP-The Chamber Music Network’s self grading system at www.system.acmp.net) Please include a description of your musical background and chamber music experience. Tuition for the entire session is $800. The application along with a $100 deposit is due by May 1st, The $100 deposit is refundable only to applicants who withdraw before the April 1st deadline. The remaining balance will be due by June 15th. We regret that we cannot refund any fees after July 1st. Participants may make reservations directly with our sponsoring hotel, the Hotel North Woods, at www.hotelnorthwoods.com, (518) 523-1818 or (866) 294-7171. 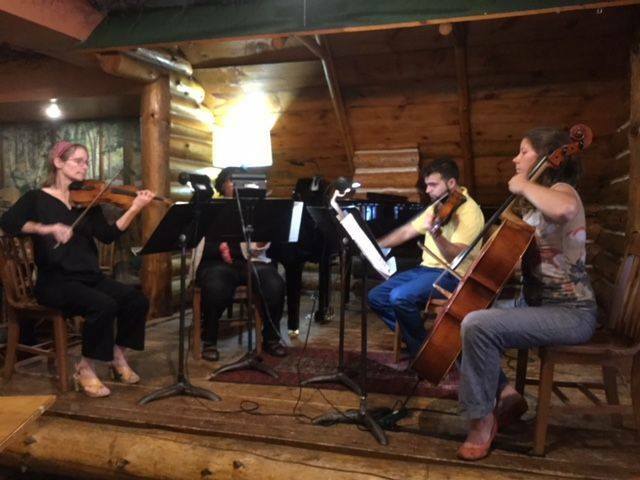 Reference the Lake Placid Institute Chamber Music Seminar to receive a special rate. Special rates are available if reservations are made by July 1st. This program is sponsored by the Lake Placid Institute and made possible, in part, by grants from the Singing Field Foundation, The Delmas Foundation, ACMP—The Chamber Music Network and the generous sponsorship of The Hotel North Woods and Artist Pianos of Albany. Linda Rosenthal, Founder and Artistic Director the Lake Placid Chamber Music Seminar, has performed throughout North America, Europe, and Asia in recitals, as soloist with orchestras and as a chamber musician. Based in Juneau, Alaska, Rosenthal performs in virtually every corner of the State in addition to her many concerts in the “lower 48.” She is also Founder of the annual Juneau Jazz & Classics Music Festival where she served as its Artistic Director for 30 years. Kathleen Butler Hopkins received her Bachelor and Master of Music degrees from the Juilliard School and her Doctor of Musical Arts degree from Yale University. Her concert credits include performances in Carnegie and Merkin Recital Halls in New York and the Kennedy Center. Ms. Butler-Hopkins is Professor of Music at William Paterson University of New Jersey. Steve Heyman performs solo recitals, chamber music and concertos throughout the United States, Canada, and Europe. He has won top prizes in over a dozen national and international competitions and currently serves on the faculties of Colgate University and Syracuse University where he is an associate professor and co-chair of the Keyboard Department. Laura Klugherz performs as a soloist, chamber musician, and concertmaster. She toured as soloist with the Munich Chamber Orchestra in both Europe and the U.S. As a recitalist, she has performed throughout Spain, South America, and the United States. She is Professor of Violin/ Viola and Chamber Music, and Director of the Colgate Chamber Players at Colgate University. Jeffrey Solow maintains a busy schedule concertizing and teaching throughout the US, Europe, Latin America, and Asia. He also writes on a variety of cellistic topics and edits music for the cello. As a chamber musician, Mr. Solow has performed at the Santa Fe, Spoleto, Sitka, and Marlboro Festivals. and is currently Professor of Cello at Temple University. For further music-related information, please contact me at linda.rosenthal@gmail.com or via cell at 917-545-7103. For general information, please contact the Lake Placid Institute at 518-523-1312, via email at info@lakeplacidinstitute.org or by regular mail at the Lake Placid Institute, P.O. Box 988, Lake Placid, NY 12946.